All the best luau party ideas to turn your party into a tropical triumph! 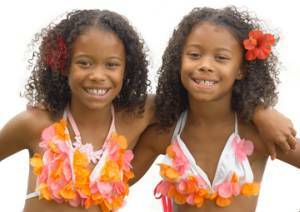 Luau is the Hawaiian word for festival or feast but a luau also makes a great party. Everyone enjoys dressing up Hawaiin style. 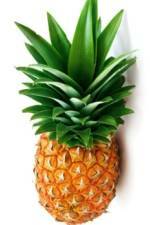 Add some tasty luau party recipes and some great luau party games and you have a tropical cocktail of fun. 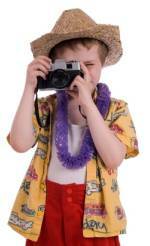 Create a mini holiday brochure writing the party information as an advertisement for a tropical paradise. Add shells and strings of shells and driftwood for a tropical beach feel. Hula skirts for the girls. You can either buy these or make your own from coloured raffia. 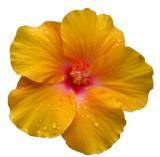 Hawaiians are renowned for wearing leis - pendants of real or paper flowers or necklaces that follow clear patterns. Luau party games are friendly and fun. All these games can be played indoors or outside. Divide your children into 2 teams. Line them up as if they were going to play follow my leader. Hand the first child in each line a coconut. They pass this over their head and behind them to the next child. Child 2 takes the coconut and passes it through their legs to the child behind them. The third child passes back over their head, the fourth through their legs and so it continues until the coconut reaches the last child. The final child takes the coconut and runs to the front of the line. They then pass it back over their head and start the whole process again. The game continues until the original child is back at the front of their line. The first team to raise their coconut in the air wins. The children then sit on opposite sides of the room facing their fruit partner. Allow a fair bit of space between the rows. They can be on chairs or cushions. Allow a little room either side. One child is then selected to be Freddy Fig and comes to stand at a set distance away from the others. The adult helper then calls the name of a fruit. That fruit pair have to swap places with each other before Freddy Fig can run and jump in one of their seats. If he succeeds Freddy becomes the new fruit partner and the fruit who has just lost out has a turn at being Freddy Fig. Everyone stands in a circle and music is played while a hoop is passed from one to another. Every person receiving the hoop must put it over their body and climb through it before passing it on to the next person. if you are holding the hoop when the music stops. You have to show everyone your hula dance with the hoop. Then you are out and have to sit out while the game continues. Place all of your items carefully under the sheet separated out so they are apart from one another. This works well on the floor or on a table in the middle of the room so that the children can move all the way around. Pop a sticky label on top of the sheet for each one saying Fruit 1 - Fruit 2 and so on. The children either working in teams or individually have to guess the fruits by simply feeling and squeezing gently through the sheet. Young children love this game as much as older ones so they may like to whisper their guesses to an adult who can write down their answers. At the end do a fruit by fruit reveal to see who guessed most correctly. Find some calypso or conga type music and have the kids dance around in a circle. The limbo stick is held by 2 adult helpers. When they reach it all the kids must limbo under without touching. After each round the stick is lowered making the limbo harder and harder. In theory to limbo properly you go under the stick leaning backwards. In reality you may find the children (especially younger ones) develop their own unique methods!! Its up to you whether you turn it into a competition or just have some fun. When it gets really low however its nice to have everyone gather round and clap in time to the music as the dancers limbo under. Something else that kids love is when parents join in so don't forget to challenge the Mums and Dads too! A limbo is a great way to finish up your party. But I never get the chance. But all she wants to do is dance!